This file photo shows an installation belonging to Saudi oil giant Aramco in the western part of Saudi Arabia. Sana’a(ANN)-Fighters from Yemen’s Houthi Ansarullah movement have fired two ballistic missiles at a Saudi Aramco facility in the country’s southwest. 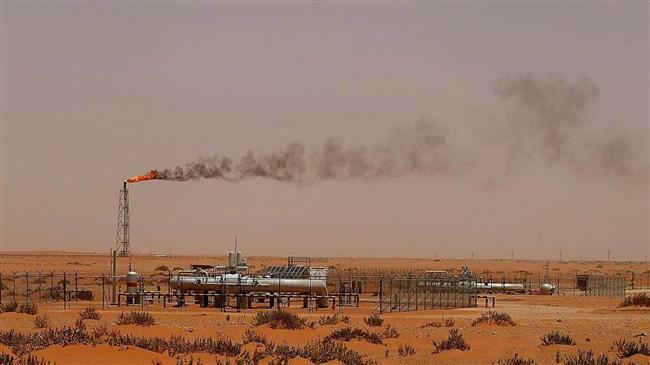 Yemen’s Arabic-language al-Masirah television network said on Monday that two Badr 1-type missiles had targeted the oil facilities that belong to energy giant Aramco in the Saudi border province of Jizan. There was no immediate report on possible casualties or damage. Saudi state media claimed that the country’s air defenses had intercepted and destroyed both projectiles over the skies above the region. The attack was carried out following bombardment of a wedding ceremony in Yemen’s Hajjah province by Saudi jets late on Sunday, which claimed the lives of over 30 civilians, including women and children. The Yemeni army also targeted several cities, including the capital Riyadh, with a barrage of ballistic missiles on April 11. Yemenis’ attacks on positions of Saudi Arabia are in retaliation for air raids on the impoverished Arab country by the Western-backed Saudi coalition. Saudi Arabia launched a military campaign in March 2015 in support of Yemen’s former Riyadh-friendly government of president Abd Rabbuh Mansur Hadi and against the country’s Houthi Ansarullah movement, which has been running state affairs in the absence of an effective administration.